The new results also mark the first discovery of dwarf galaxies — small celestial objects that orbit larger galaxies — in a decade, after dozens were found in 2005 and 2006 in the skies above the Northern Hemisphere. 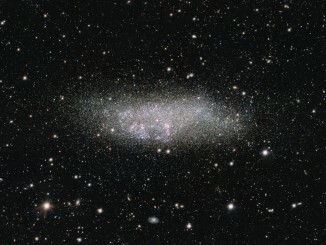 The new satellites were found in the Southern Hemisphere near the Large and Small Magellanic Cloud, the largest and most well-known dwarf galaxies in the Milky Way’s orbit. The Cambridge findings were jointly released March 10th with the results of a separate survey by astronomers with the Dark Energy Survey, headquartered at the US Department of Energy’s Fermi National Accelerator Laboratory. Both teams used the publicly available data taken during the first year of the Dark Energy Survey to carry out their analysis. The newly discovered objects are a billion times dimmer than the Milky Way, and a million times less massive. 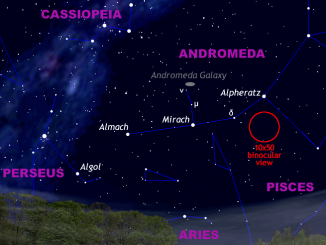 The closest is about 95,000 light-years away, while the most distant is more than a million light-years away. According to the Cambridge team, three of the discovered objects are definite dwarf galaxies, while others could be either dwarf galaxies or globular clusters — objects with similar visible properties to dwarf galaxies, but not held together with dark matter. Since they contain up to 99 percent dark matter and just one percent observable matter, dwarf galaxies are ideal for testing whether existing dark matter models are correct. Dark matter — which makes up 25 percent of all matter and energy in our universe — is invisible, and only makes its presence known through its gravitational pull. The closest of these pieces of ‘treasure’ is 97,000 light-years away, about halfway to the Magellanic Clouds, and is located in the constellation of Reticulum, or the Reticle. Due to the massive tidal forces of the Milky Way, it is in the process of being torn apart. The most distant and most luminous of these objects is 1.2 million light-years away in the constellation of Eridanus, or the River. It is right on the fringes of the Milky Way, and is about to get pulled in. According to the Cambridge team, it looks to have a small globular cluster of stars, which would make it the faintest galaxy to possess one. 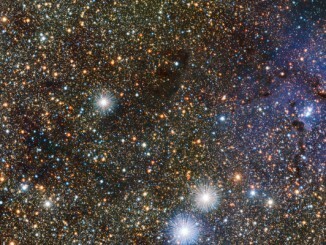 The Dark Energy Survey is a five-year effort to photograph a large portion of the southern sky in unprecedented detail. Its primary tool is the Dark Energy Camera, which — at 570 megapixels — is the most powerful digital camera in the world, able to see galaxies up to eight billion light-years from Earth. Built and tested at Fermilab, the camera is now mounted on the four-metre Victor M. Blanco telescope at the Cerro Tololo Inter-American Observatory in the Andes Mountains in Chile. The camera includes five precisely shaped lenses, the largest nearly a yard across, designed and fabricated at University College London (UCL) and funded by the UK Science and Technology Facilities Council (STFC).